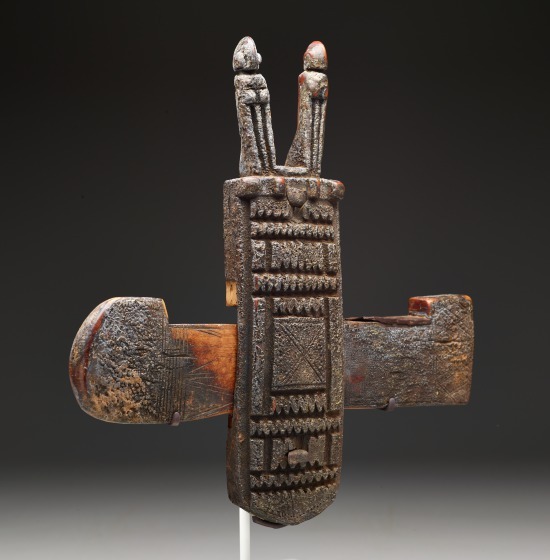 The Dogon peoples used wooden bolt locks (ta koguru) to secure the doors to houses, interior rooms, granaries, and some shrines. 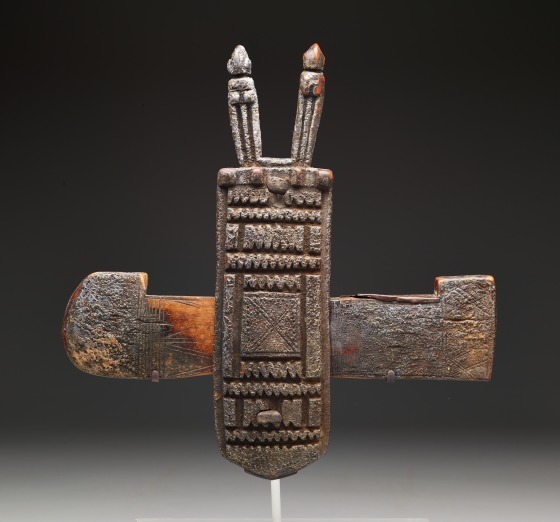 This type of lock was introduced to sub-Saharan Africa with the spread of Islam from the Near East and North Africa. 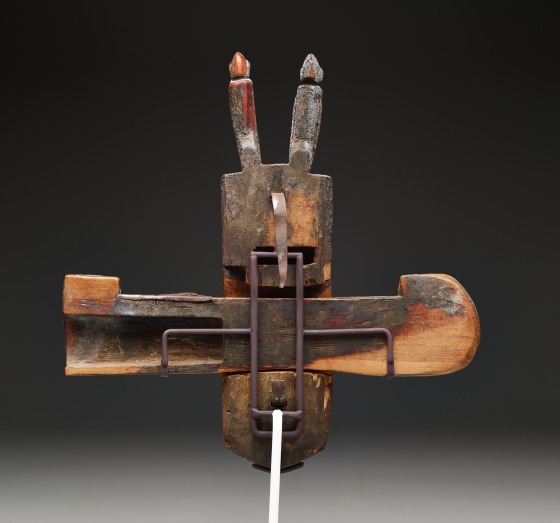 The lock is composed of three separate pieces: the vertical beam; the cross beam that slides into a cut-out rectangle in the back of the vertical beam, which is furnished with metal prongs; and a wooden toothbrush-like key that slides into a hollowed out part of the crossbeam. Dogon farmers store millet and other grains in thatched granaries made of mud and small stones. In the past, granaries, sanctuaries, and chiefs' houses had sculpted doors and locks decorated with symbolic imagery. 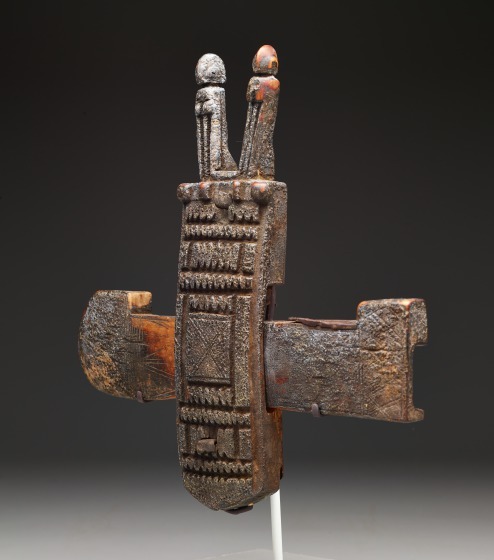 Dogon, who were not converted to Islam, decorated their bolt locks with animal or human figures and geometric patterns inspired by Dogon religious beliefs. 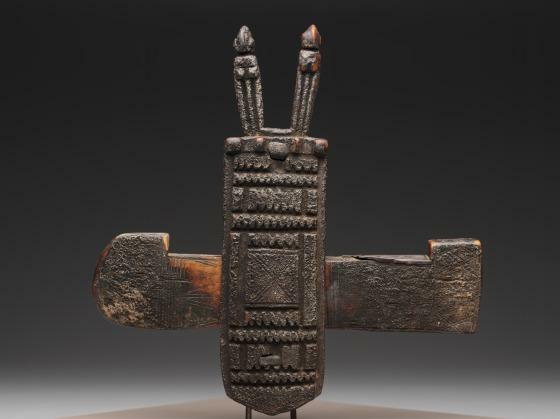 Images of animals and humans carved in relief on the doors and locks of houses, granaries, and sanctuaries relate to Dogon ideas about the Creation and fertility. 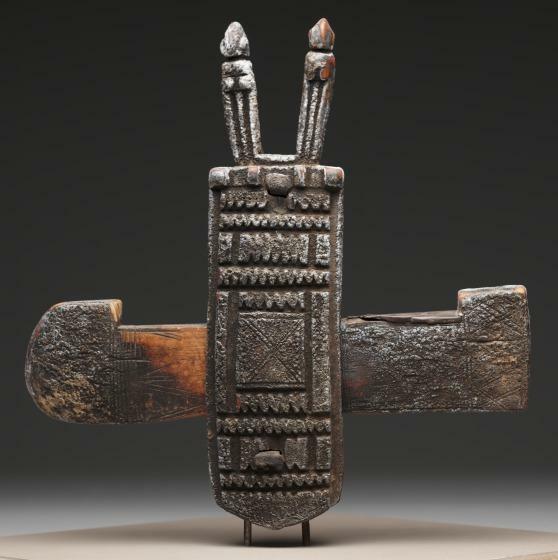 The two figures carved on top of this lock depict the primordial couple (nommo) in an abstract manner. 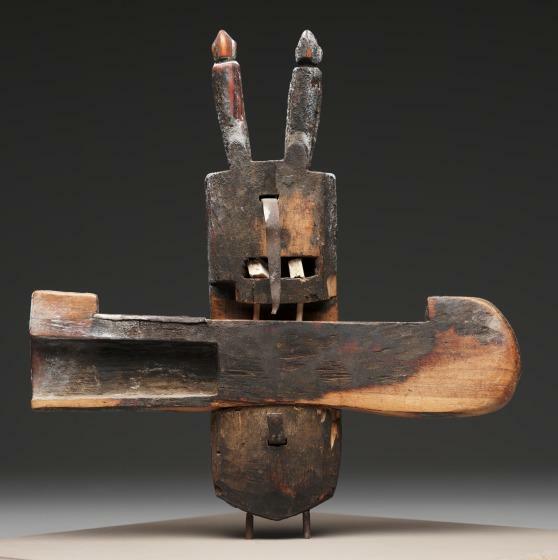 The nommo in Dogon mythology are the offspring of Amma (God) and the Earth. They were born bisexual and their bodies were jointless. Because the male element dominated in one and the female in the other, the original nommo were able to procreate and give birth to the four pairs of original ancestors of humankind. Geometric patterns carved in low relief on the vertical beam include zigzag lines and a square containing a cross. According to Dogon mythology and interpretations of other works of art displaying this motif, zigzag lines arranged horizontally represent the course along which an ark carrying civilization traveled from the sky to the earth. The cross within the square may symbolize the cardinal points in space. 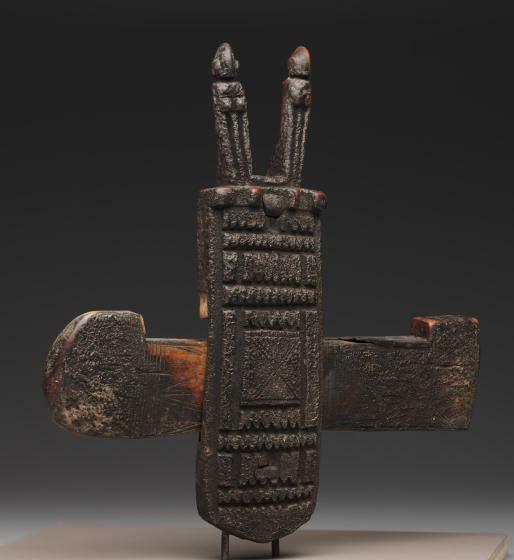 The Dogon have used Western-style padlocks since the 20th century to secure their doors. Where sculptors are still available to carve wooden locks, the locks are either devoid of carved decoration or are decorated with a carved lozenge that represents the head of a lizard or the Islamic symbol of the crescent moon. 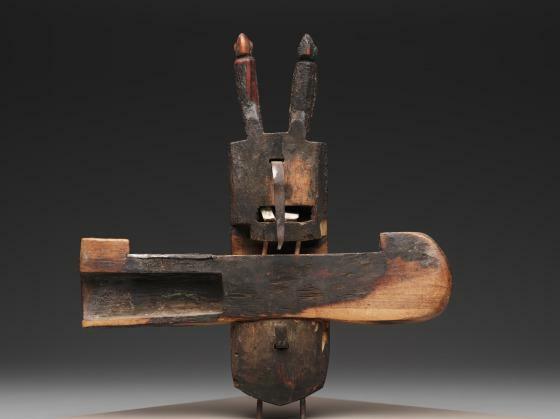 Roslyn A. Walker, The Arts of Africa at the Dallas Museum of Art (New Haven and London: Yale University Press, 2009), 222-223.